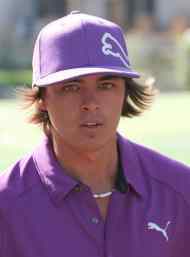 Rickie Fowler was the top ranking amateur golfer in the world for 36 weeks in 2007 and 2008. He secured his first victory as a professional at the Wells Fargo Championship in 2012 by defeating Rory McIlroy in a playoff. He finished tied for fifth place in the British Open Championship in 2011 and is widely regarded as one of the most promising talents in the game. In 2005, Fowler won the Western Junior and competed in the U.S. Amateur, losing to the eventual champion Richie Ramsay. He then attended Oklahoma State University and achieved his first collegiate victory at the Fighting Illini Invitational in October 2007. Fowler represented the successful United States Walker Cup team in the same season, scoring three of a possible four points for his side. He also won the Sunnehanna Amateur in June and the Players Amateur in July. In 2008, Fowler successfully defended his Sunnehanna Amateur title and put up a brave display at the US Open, opening with a one under par 70 and in a tie for 7th place. Although his challenge petered out, he will have gained tremendously from the experience. In 2009 Fowler won all four Walker Cup matches that he was involved in as the U.S. won by a seven clear points. His impressive display in the Walker Cup prompted him to turn professional and he became hot property, quickly being signed up by both Titleist and Puma. He finished tied for second in only his second PGA Tour event, the Frys.com Open in Scottsdale, Arizona. He lost out to Troy Matteson in a three-way playoff. His final round included a hole in one on the fifth hole. In February 2010, Fowler was again runner-up in Scottsdale, this time at the Waste Management Phoenix Open. In June, he filled the same placing at the Memorial Tournament in Dublin, Ohio. Despite losing out to Justin Rose, his performance took him into the top 50 of the Official World Rankings for the first time. In September that year, he was named as a Captain’s Pick for the US Ryder Cup team. At the age of 21 years and 9 months, Fowler became the youngest American to compete at the Ryder Cup in history. Fowler staged a remarkable recovery in his singles match against Edoardo Molinari, producing birdies on each of the last 4 holes to halve the match. He was controversially named Rookie of the Year in preference to Northern Ireland's Rory McIlroy. Still seeking his first victory on Tour, Fowler exceeded expectations by finishing tied for 5th in The British Open Championship at Royal St George's. He also finished tied for second at the WGC-Bridgestone Invitational behind Adam Scott, and reached 28 in the world rankings. Fowler briefly threatened at the 2011 US PGA Championship, opening his third round with three birdies in five holes before dropping back through the field. His first win as a professional arrived in October 2011 when he won the Kolon Korea Open on the Asian Tour, defeating McIlroy by six strokes. His first win on the PGA Tour followed in May 2012, again at the expense of McIlroy, this time winning the Wells Fargo Championship in North Carolina in a sudden-death playoff. This victory put Fowler into the top 25 of the World Rankings and he almost won back-to-back titles when finishing tied second the following week in The Players Championship in Ponte Vedra Beach, Florida. He is, without doubt, one of the most exciting young players on the Tour.